This past Monday night our First Year Seminar gathered together for a food tasting meal—an event that gave us a chance to taste a wide variety of foods in dialogue with the books we have been reading and discussing so far this semester. In Part One of this post I summarized some of those books, our menu and the experience of shopping for all of the items—complete with photos. While dreaming up that menu and shopping for the foods was fun, it was nowhere nearly as enjoyable as preparing for the meal and trying the different foods. Having never gathered together so many people for a such an ambitious meal in a modestly-sized home, I was a bit anxious about how it would all work out. Cooperation, organization, collegiality and a good dose of curiosity, however, smoothed over the rough edges and made it a very successful event. I was very proud of the class, and hope that they learned as much as I did. In the end, our tasting meal was served in over eight courses to twenty people and was a two-hour practice of academic and culinary commensality. Cooperation, organization, collegiality and a good dose of curiosity, however, smoothed over the rough edges and made it a very successful event. I was very proud of the class, and hope that they learned as much as I did. In the end, our tasting meal was served in over eight courses to twenty people and was a two-hour practice of academic and culinary commensality. The meal preparation began with the early arrival of a handful of volunteers who helped set the table, portion out samples and cut and prepare the foods. By the time the rest of the class arrived at around 5pm the first plates and assembled tasting cups were nearly all ready to go. 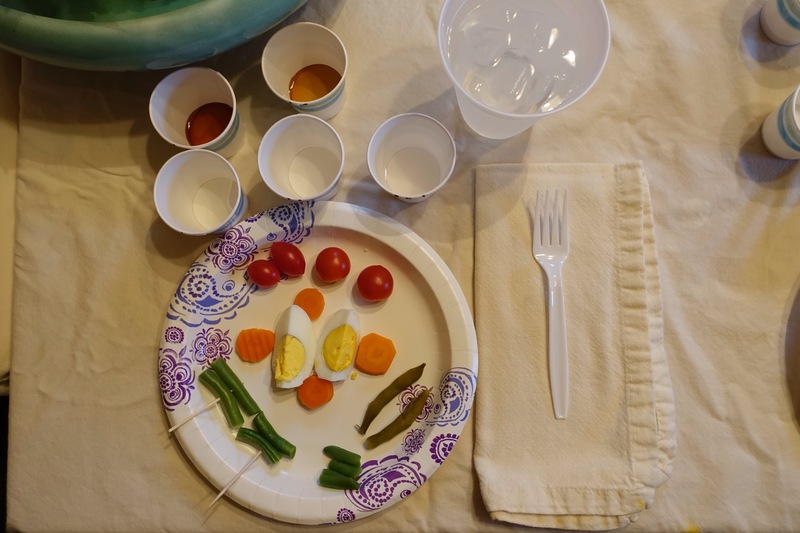 While paper plates and cups were not as fancy as fine china would have been—and the aesthetics of our plating skills were far from those of a fine dining establishment—we certainly made the gesture. We began with a cold plate “salad” of various vegetables, a apéritif of sugars, and different lemonades as a drink. The diners didn’t know which one was which and guessing was part of the fun of the event. Pure Maple Syrup, "Pancake Syrup"
After everyone sat at the table we said a few words about the event, were led in a ’round-the-table wave by Travis, and then began. One by one we picked up the foods, tasted them together and then took a brief few moments to comment on how their texture, taste, smell and appeal. Since I was directing this process, I wasn’t able to take good notes. The comments and reactions, however, were surprisingly consistent. Simple syrup of sugar was by far the sweetest and longest-lasting flavor. Many diners had never tasted stevia and were surprised by its unusual flavor. Likewise, it was very easy to tell the difference between the pure maple syrup and the “pancake syrup” made of corn syrup. The textures were completely different, as was the level of sweetness. Interestingly, a substantial number of diners preferred the artificial “pancake syrup” flavor and consistency over the real maple syrup. Among the vegetables, the diners easily distinguished the watery and squishy frozen vegetables from the others. Likewise the canned vegetables were simple to spot because of their appearance and “canned” salty flavors. A majority were able to easily distinguish the farmer’s market vegetables from the conventional store-bought ones based on crisper texture and “more vegetable” flavor. While there was more disagreement about the green beans, everyone correctly identified the carrots and tomatoes. The difference between the eggs, however, was the biggest surprise. The farm fresh eggs had clearly richer colored golden-yellow yolks compared to the pale ones of the conventional supermarket. Upon eating them many of us were surprised by the soft, buttery mouthfeel and rich full flavor of the farmers market eggs that lingered in the mouth for a while. By comparison the store-bought ones were rubbery and “simple” in their feel and flavor. The difference was stark. The first plate was followed by some sides of corn and green pepper. The reactions to these vegetables were similar to the earlier ones—frozen and canned were easy to identify with conventional and farmers most easily distinguished by flavor. We also had a brief pause in the meal to try a kernel of #2 Feed Corn of which diners took a bite of and then promptly spit out into an extra napkin and threw away—a lesson in the inedibility of the “food” that is grown all around us. The meats were served simply with no additional spices or flavorings—the chicken breast was simply poached and the steak panfried and served medium rare. The reactions to the foods were largely uniform with only a few outlying opinions. Nearly everyone could identify the difference between the meats. The free range chicken had a more delicate texture that was “more meaty” and tasted more like chicken, while the conventional store-bought chicken was comparatively rubbery and had a more “watered-down” flavor that wasn’t as rich and didn’t linger on the palate. Because of the bland flavor of the simple chicken breast, after the initial tasting and comments, we provided some Korean Kalbi Dipping sauce for folks to enjoy while eating the rest. Of course, that is exactly the role sauces play in out conventional food system—to make up for the bland flavors of processed or flavorless foods. They are mystery objects of our culinary culture. Likewise the steaks—which were the same cuts and of similar thicknesses and prepared the same way—were very easy to tell apart. The grass-fed steak had a deep, meaty-steak flavor and a flaky texture. The mouthfeel was lean but rich and needed no condiments to be enjoyable. By contrast, the conventional corn-fed steak was rubbery and fattier but had a simple flavor that was nowhere nearly as “beefy.” (Not being a food specialist, I really don’t have the vocabulary to describe these differences very accurately.) 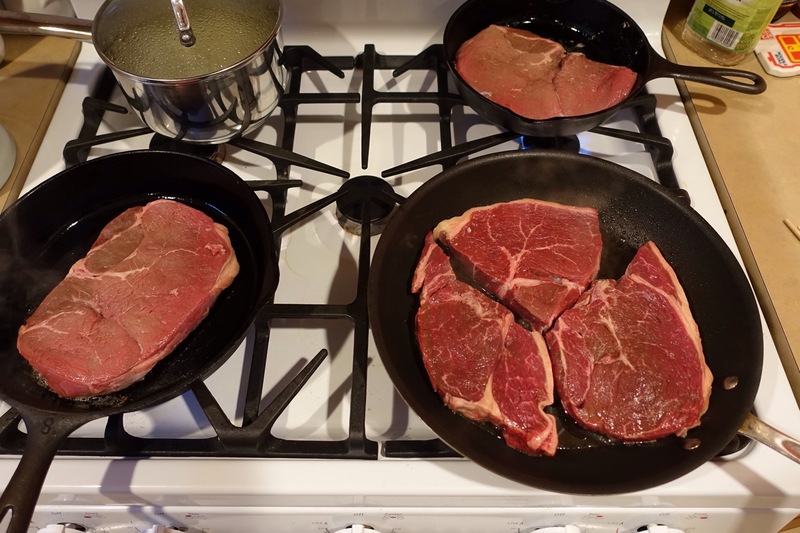 In terms of appearance, while cooking and eating, the two steaks were obviously different. Perhaps tellingly the plate of grass-fed steak was quickly consumed while a few leftover pieces of the conventional steak were left cold and uneaten—until I gave them to my dog. In terms of price, there was also a huge difference. The grass-fed steak was nearly three times as expensive. After the protein course, we took a break from our tasting for a bit more food to make sure that everyone left the meal fully satiated. This was also the opportunity for folks that were vegetarian to eat something more substantial—as they had to patiently sit by while the omnivores ate the meats. To thank them for their patience and to introduce some tasty non-meat options to all of the pizza eaters, we chose pizzas from our own, local, Pizza Luce. Following the pizza course we had a cheese and fruit plate which featured a selection of cheeses and fruits. Unfortunately at this time of year in Minnesota there are not many fruits in season. We would have liked to use pears, but store-bought pears take a few days to ripen and we hadn’t prepared early enough. So, we were left with bananas and local apples. 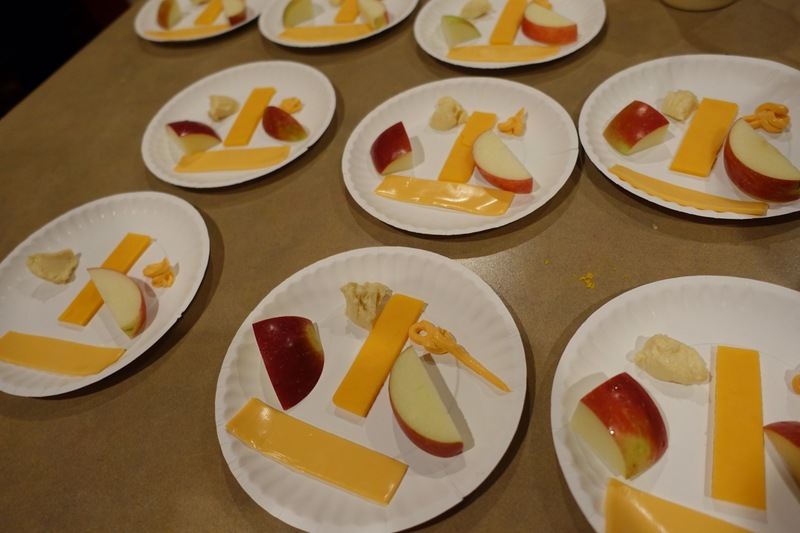 The cheeses were clearly identifiable, so there was no guesswork involved in which was which. There was no general consensus as to the different flavors and textures. A substantial minority voiced some strong opinions about the strong flavor and unusual “grainy” texture of the raw cheese. Also, many of the slices of American Cheese singles were left uneaten because even at room temperature they managed to melt just enough to adhere to the paper plates—leaving the unappetizing option of scraping them off to eat. As for the fruits, the apples were easily identified by their flavor. The farmer’s market apples were tarter and crisper and had a stronger flavor than the store-bought apples. This, in spite of the fact that the store-bought apples were advertised as locally grown Minnesota apples as well. The difference between organic and conventional bananas were indistinguishable at the level of taste, but did have some texture and visual differences. Finally, our meal concluded with a fine dessert of apple pie and whipped toppings. 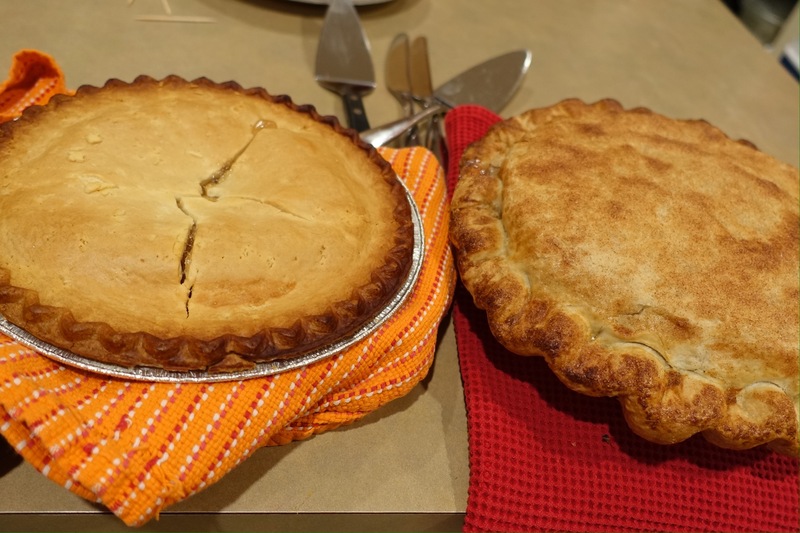 Initially we had hoped to possibly have a homemade pie, but that was a bit too ambitious, so we decided to purchase two different pies—one a frozen Sara Lee® Apple Pie and the other a pie “made from scratch” from a local restaurant, The Colossal Cafe. These were served with sides of whipped cream and Cool Whip. The whipped toppings offered a much more interesting contrast. Their different texture and flavor were easily identified—the Cool Whip was firm and super white and had a strong vanilla flavor and a full mouthfeel. It really tasted like whipped candy. The whipped cream tasted like a dairy product, was not as firm nor as sweet. They really were two different products—even though they share a similar appearance. A number of diners clearly preferred the Cool Whip and at least one person said they really didn’t like the strange flavor of the whipped cream. After the pie our meal concluded with everyone sitting around for a short while to chat and talk before heading home quite full. Of course in the end our meal was not some kind of scientific focus group study of the differences between foods and preparations. There were plenty of moments where the differences between foods—their appearances, flavors and textures—could have been due to many factors. Nevertheless the meal did complement our academic reading and discussion by making us aware of those differences. Comparing the same foods side-by-side heightens the sense of difference. The fact that a majority of the twenty people at the meal correctly identified the different foods nearly every time does suggest that these differences are consistent and identifiable. Of course there is, as we have been discussing in class, more to food than just the flavor, there are ethical dimensions to our food choices that this class meal did not capture in much detail. Meals, however, are also about eating together—sharing food and conversation at a table while engaging in a fundamental human activity. In this sense I hope that our class tasting meal was a big success. Fascinating! I wish I had taken part in your gastronomic adventure. It was fun, and made me wish that a restaurant owner somewhere would put together a similar event. It really was fun to taste these things side by side, but I’m sure someone could do it more professionally. Thanks for leaving a comment. 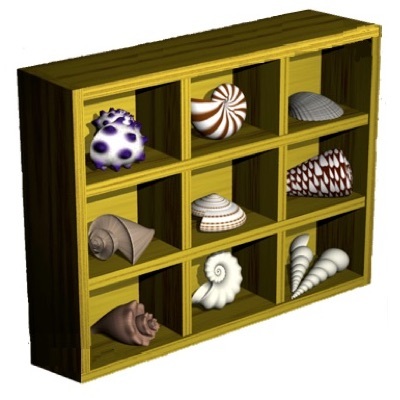 David–what a fabulous learning opportunity for your FYSEM! Thanks for sharing both Parts!